Our exploration of the culinary experiences Milwaukee has to offer continued . . . This time, it took us to Balzac Wine Bar, a small-plate dining restaurant with everything imaginable hanging on the walls, from stuffed deer heads to glistening chandeliers to framed paintings of all sizes. I really enjoy unique niche places like this that certainly have their own character about them. I was also pleased with the wide selection of single malts featured behind the bar. On this particular evening, we were fortunate to be able to take advantage of the half price bottles under $60. As such, we essentially drank two for the price of one. Following the tapas-style menu, we ordered five dishes to start with. 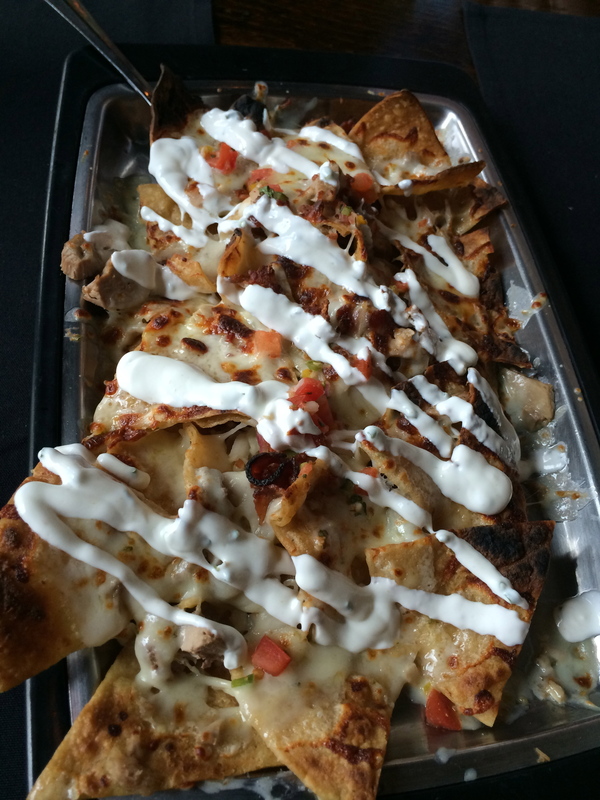 First, the Roasted Duck Nachos (above), with bacon, gruyere cheese blend, scallion creme fraiche and pico. The tortilla chips were light and crispy. The creme fraiche was refreshing against the gruyere, and the pico brought a wanted acidity to the dish. 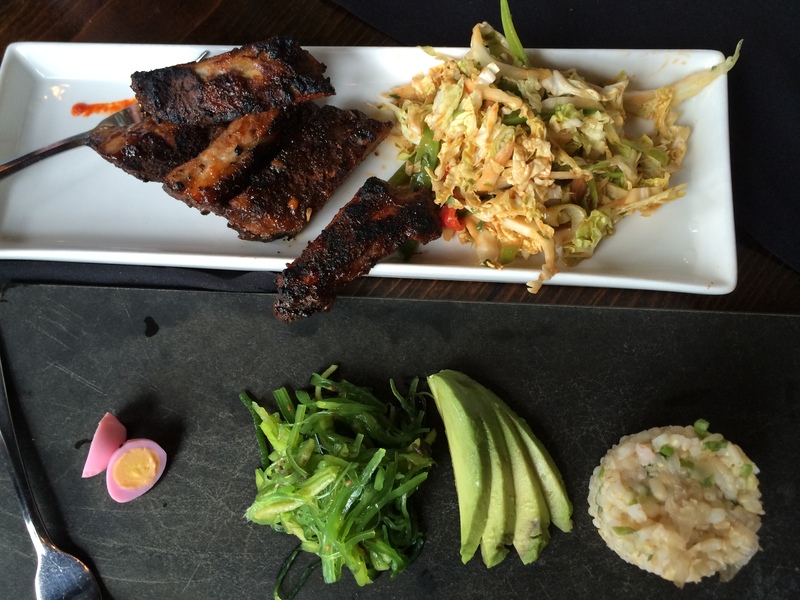 Next, the 5 Spice Baby Back Ribs (on top in the picture) and the Waki Maki (bottom). The 5 Spice ribs were wonderfully tender with a lovely exterior crust. I really enjoyed the 5 spice flavor, which went exceptionally well with the accompanying spicy napa cabbage slaw. The Waki Maki was a lovely treat, both visually and for the taste buds. In the center, a wakame (seaweed) cucumber salad and ripe avocado slices. On the left, a ginger pickled quail egg, and on the right brown sticky rice with bonito flakes. This was a really well balanced plate. The sweetness from the wakame combined with the creamy avocado, the sourness of the egg, and the nutty flavor of the rice made this one of my favorite dishes of the night. 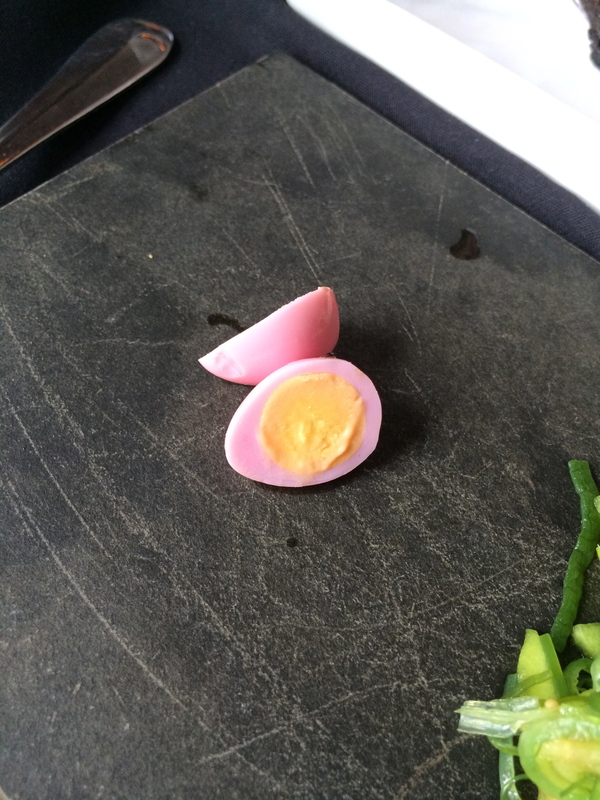 The quail egg was just so beautiful with the bright pink, I had to give it its own close up! Next came the Russian Salmon Skewers. I know this picture is a little awkward with that fork, but bear with me, it’s always hard to convince your fellow diners to hold off on digging into the delicious looking plates in front of them so you can snap a quick picture of the dish. 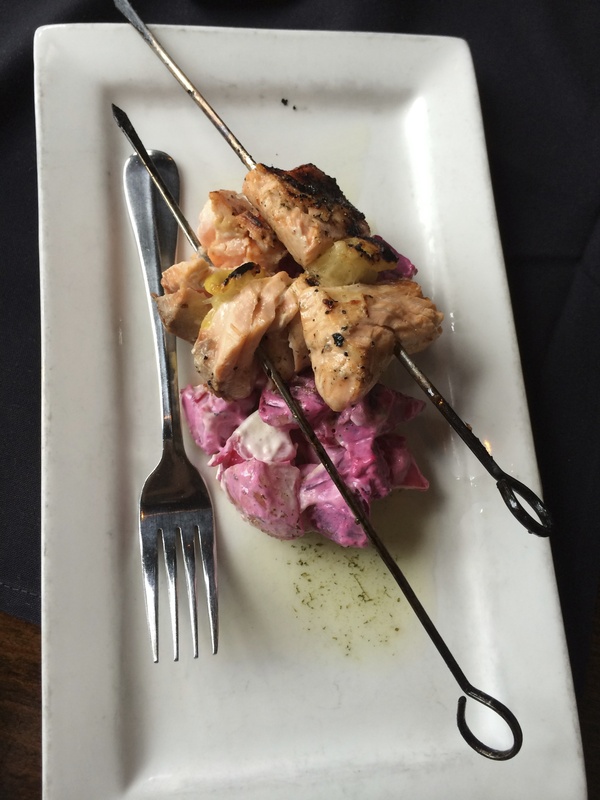 The Salmon Skewers came with a potato beet salad and tarragon. It has been quite a rare occasion when I have had a cold potato salad at a restaurant, but I was very glad to have it here. The beets turned the potatoes and their dressing a beautiful pink color, and the entire mix was light and refreshing. In between the salmon pieces were cooked slices of lemon. They had been softened enough to be able to enjoy them along with the salmon, and I loved it! 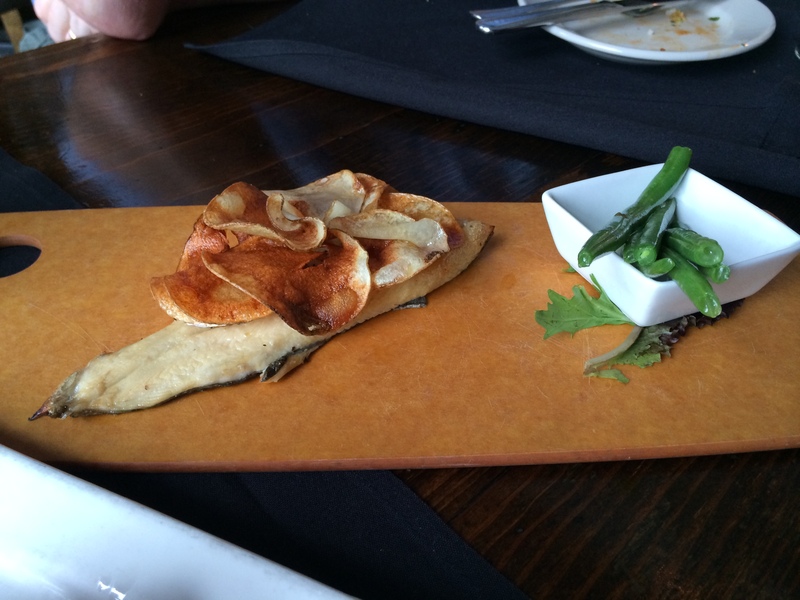 Our last entree dish was the Wood Plank Trout served with green beans and a potato spiral. The potato spiral was tasty, much like an extremely thin and crunchy potato chip. The green beans were a great addition to the plate and brought some much needed color. The trout was simply smoked, allowing us to experience its flavor without distraction. In my opinion, however, it could have used a little more salt or maybe some lemon. I did try the trout with some lemon from my salmon and it was quite good. My mom decided what the trout needed was soy sauce. My dad said it was the best pure form of trout he has had in recent times. This is a vacation so, of course, we had dessert. 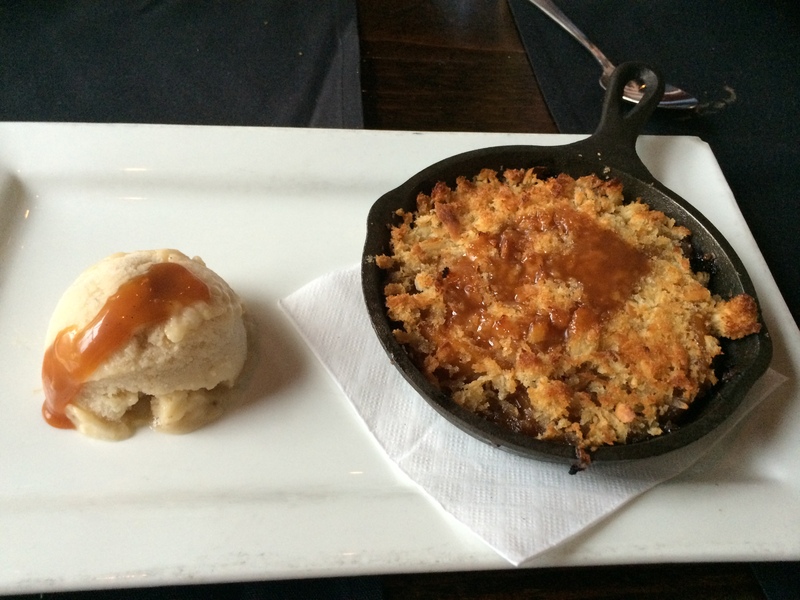 We selected the Peach Cobbler with a ginger crumble and ginger banana ice cream. First, the ice cream. I have tried my hand several times lately at the popular “one-ingredient banana ice cream” that has been floating around the Internet. For anyone who is unfamiliar, you simply freeze sliced banana pieces then use a food processor to blend the frozen banana into an ice-cream-like consistency (food processor works MUCH better than a Magic Bullet or something similar btw). I usually add a tablespoon of peanut butter and sometimes some almond milk to improve the texture. Anyway, the reason I bring this up is because this ginger banana ice cream had the same taste and consistency as the one-ingredient-banana-ice-cream with which I have recently become so familiar. Therefore, I believe that this in fact was the very same banana “ice cream”. I am not complaining of course (no added refined sugar or cream, so less calories), but it was something interesting I believe I figured out. Yes, the taste of it was still good, and the ginger was subtle enough not to overbalance any other flavors. As for the crumble . . . the peaches were good – soft and plentiful (I hate crumbles where you can’t even FIND the fruit). 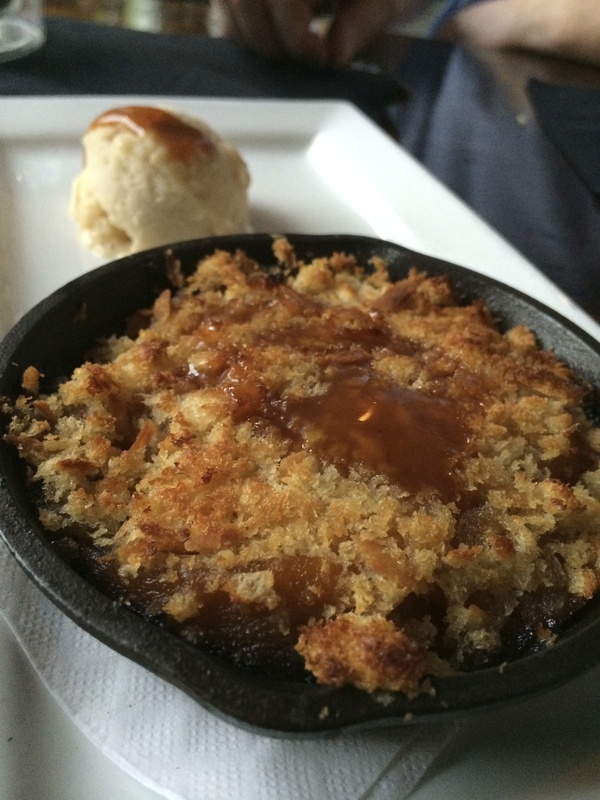 The crumble part, however, was not traditional and not necessarily something I would order again. Instead of small pea-sized balls of mixed butter, flour, sugar and spice, this crumble seemed almost to have been made from panko or some kind of breadcrumb. It was much more crispy and crunchy than crumbly (I think you can tell in the picture above), and I do prefer the softness of a crumble that seems to melt into the soft fruit and ice cream. Taste was decent, but overall I felt this was a take on a crumble that went in a direction I would not have taken myself. Nevertheless, this was still an excellent dining experience. I really do enjoy a more tapas-style dinner that gives me the opportunity to try a wider variety of dishes than simply one entree. In fact, one of the best meals I ever had was in Florence where I had 14 courses of small plates of traditional Italian dishes. There is no way I would have had the opportunity, nor the budget, to experience so many different foods had it not been for the small-plate format of the dinner. And yes, I did feel like I had to be wheeled out of there once we finally ended the meal with some melt-in-your-mouth-delicious squares of fudgy chocolatey goodness.